Random PDF Feature in the Macintosh category! In 1994, I was looking for a new computer and really wanted to get a Quadra 610 because I like the look and feel of the computer. ComputerTown had a Centris 660av which they told me was the same type of computer. I really enjoy using the Centris 660av, the multimedia capabilities were years ahead of what was available in the PC world. I enjoyed digitalizing audio and video files, it was very easy to do and it was cool seeing video on the computer screen. Today the computer sits in the basement of my house. It hasn't gotten much use over the years, but it is still in good shape. I backed up the entire hard drive to a CD before I decommissioned it. I don't know what I'll do with the computer in the future. 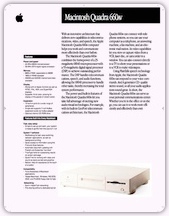 Download the Quadra 660av Spec sheet and see what great computers Apple Computer put out in 1993.